Between 1948 and 1967, when Jerusalem’s Old City was under Jordanian rule, the closest that Israelis could come to the Temple Mount was Mount Zion, a hill just outside the walls on the southern end of the Old City. 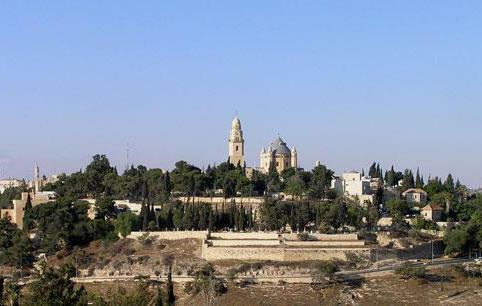 The hill has been called Mount Zion since sometime in the MiddleAges, even though Jewish scripture refers to the Temple Mount by the same name. Interestingly enough, legend has it that Sultan Suleiman the Magnificent initially meant for Mount Zion to be inside the walls of the Old City. However, the Turkish engineers who were planning the restoration of the walls accidentally left Mount Zion and King David’s Tomb outside the walls, prompting the livid sultan to execute them. Among the important sites and landmarks on Mount Zion are the Room of the Last Supper, King David’s Tomb, the Chamber of the Holocaust, and the Protestant Cemetery. In addition Oskar Schindler is buried here as a righteous gentile, and the Dormition Abbey is located here.